Soft and beautiful, the Multi Color Stripes pattern giclee shade perfectly complements the brushed nickel base of the Garth floor lamp. The Garth brushed nickel finish floor lamp takes a simple base design and pairs it with a striking printed drum shade for a burst of style. The shade design is custom made-to-order and features an exclusive Multi Color Stripes pattern. Shade printing process U.S. Patent # 7,347,593. Custom made-to-order drum shade with Multi Color Stripes giclee printed pattern. Is color more on the teal or greenish blue side versus just pure blue? I'm hoping it's teal. BEST ANSWER: It is more of a blue with gray undertones. 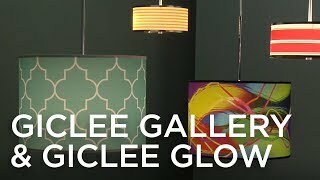 However, this lamp shade is customizable and within those selections there is a more "teal" option available.